Unless I wash you, you have no part with me. John 13:8, New International Version. It had been a particularly stressful few days—sickness, unplanned meetings, unexpected visitors, plus an assignment that took me away from home and the children for a whole day. Routine household cleaning was the last thing on my mind. Returning home at the end of the last long day, I looked around my messy home and wasn’t sure where I should begin. But when I couldn’t have a drink of water because there wasn’t a clean glass in sight, dishwashing was the obvious place to start. Somehow, without me noticing and being somewhat too tired to care, our dishes had piled up. I was shocked. While I was busy, my family had done nothing to help out. Every dish, cup, glass, mug, bowl and every utensil and receptacle was absolutely filthy! Some had to be soaked for a later scrubbing! 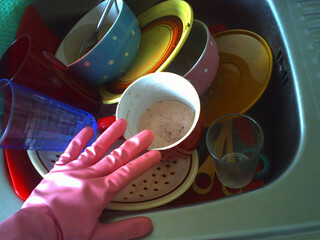 Time seemed to go on forever as I scrubbed and scoured (and scowled and screamed). And then through my frustration, I realized that my sins are far more disgusting than any stack of dirty dishes could ever be. So often I go to God with my plan expecting Him to do a quick and simple cleansing process on me and send me on my way! But then He gently reminds me that there is so much more work He has to do. With that insight, I chose not to be angry with my family. In my attempt to remove the toothpick from their eyes, God showed me the telephone pole that was lodged in my own. So wash me clean, dear Father. Do what you must to remove every impurity from my soul. Categories: Weekly Readings | Tags: Alabaster Jars, daily devotion, John 13:8, righteousness, Ruth-Ann Thompson, salvation | Permalink.